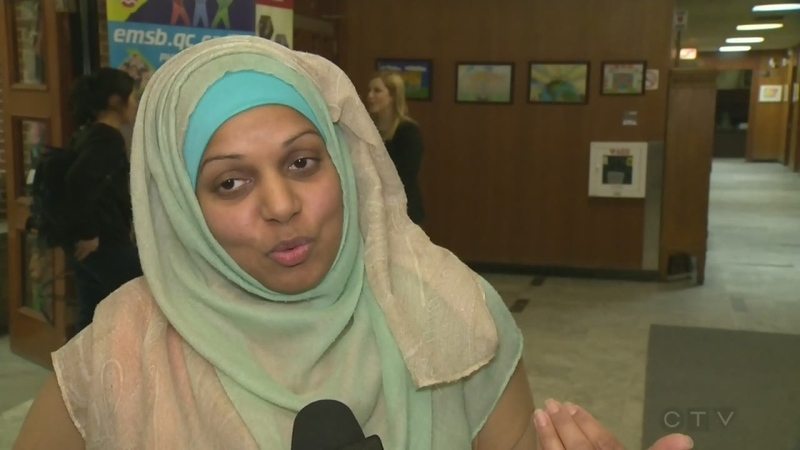 Dozens of people gathered at the head office of the English Montreal School Board on Wednesday to voice their opposition to a government plan to ban the wearing of religious symbols. Many said the situation was a repeat of the highly-divisive Charter of Values proposed in 2013 by the Parti Quebecois government. The Coalition Avenir Quebec is pushing ahead with a plan to ban the wearing of religious symbols by some civil servants in positions of authority, namely teachers, police officers, and some legal officials. At Wednesday's meeting at the EMSB, person after person gave their reasons as to why they think they CAQ's proposal is prejudicial. Sabrina Jafralie, a Westmount High school teacher, said the proposal by the CAQ was based on faulty premises. "Why does my provincial government think that my professionalism is at risk or in conflict with my ability to be religious?" said Jafralie. "Our professionalism should not be questioned and our religious symbols don't taint that, nor do they diminish my ability to teach in the classroom." Premier Francois Legault has said he believes that banning religious symbols will help fight racism, prejudice, and extremism. Critics say any such legislation banning symbols would violate Quebec's Charter of Rights and Freedoms which guarantees freedom of religion and freedom of expression. Saba Ansari, one of the very few women in Quebec, who wears a face-covering niqab, said that the government is creating a problem. "I have studied in a college and I have done jobs in different fields with a hijab and nothing was hurdle like this. My hijab wasn't any hurdle in any kind of job, so why are we making an issue?" asked Ansari. Furheen Ahmed, who also teaches at Westmount High School, said nobody has ever complained about her silent expression of her faith. "I do not agree with what the CAQ government is proposing. I'm a teacher, I've been a teacher for 12 years. I haven't been wearing the hijab for 12 years. I put it on more recently, it's a choice that I made," said Ahmed. "I've chosen to wear it because of my faith but I've also chosen to be a teacher so these are two choices that I don't think I should have to choose between." EMSB chair Angela Mancini said the CAQ's proposal fails to take important elements into consideration. "It's not hurting the children... and it's not affecting student success. So those for me are two important factors. And I think that's one of the reasons that as a community we're so strong against this. It really does go against some of our values," said Mancini. She said the focus of Wednesday's meeting was to get the pulse of the community. It was very clear after the meeting that many people feel the same way they did in 2013.